A group of ladies gathered on the porch on a comfortable summer evening. The weather might have been comfortable, but the hearts of those assembled were bumpy and torn. Ears listened intently as each lady described her spiritual struggle--an inward battle of defeat verse victory-- clash of freedom versus chains. These ladies were at the beginning stages of finding freedom and healing. As each person shared, the Lord brought to my mind a memory. On that porch, I was transported back to approximately ten years ago--a time of tears and toil. In my memory, I was kneeling over my Bible, praying. Tears streamed down my face, and my soul was drenched with the vastness of my brokenness. The ladies on the porch were overwhelmed with their own brokenness, desperate to be healed, desperate to be healthy, desperate to be whole. The Lord is not overwhelmed with our mess and He is not in a hurry. He has a plan and He is at work. His plan is to complete the good work He has begun step by step, piece by piece knitting together His beautiful work of art. It would be wonderful if we could just wake up and be completely healed and free. Wow! Wouldn't that be amazing! Sometimes the Lord does heal immediately, but the more common way the Lord brings healing and freedom is through a process. I say hallelujah to quick healing and amen!! However, if that happened, we would miss out on the beauty of seeing God work and knowing Him more intimately. 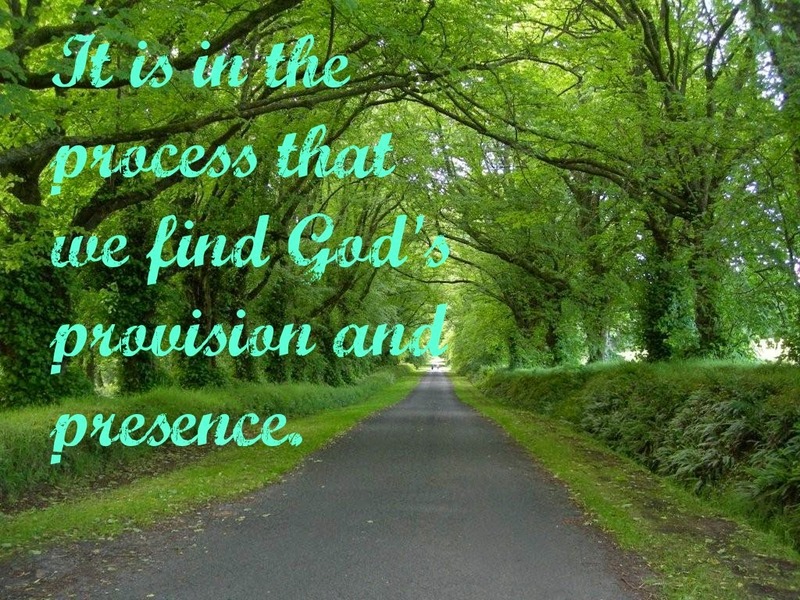 It is through the process that we discover the Lord's provision and presence. Ladies, to encourage you, I no longer feel overwhelmed. The Lord is taking me on a journey. No need to hurry on this path. It is full of beauty. Take one day at a time trusting in the Lord to finish the good work He began in you. He will. He is faithful. Draw near to Him daily and you will be amazed at where He takes you! Ten years from now, you will wake up a different person than you are today and you will be amazed! That my friends is freedom, walking daily with the Lord trusting Him. My heart pounded as I read the words on the page. A friend had recommended the book and I reluctantly read it. As I read it I knew the Lord had led me to read this book. I won't mention the book because it was controversial and there are still some parts of it that make me squirm in my seat. However, there was a part of this book where the Lord had my utmost attention. In this book, a girl had died and went to heaven and her father was able to see her in heaven through a vision. My composure broke as I read this scene. Out of seemingly nowhere tears poured down my cheeks. "I am so sorry", I softly whispered under welts of tears. I repeated these words again and again until my tears turned to heavy sobs, the kind where you can barely breath the pain is so intense. His voice gently crumpled me to my knees. He spoke, "It's ok."
I argued with the Lord. "No, it's not. It's not ok!" Yes, I know I shouldn't argue with God, but that day He seemed so wrong in what He was saying. Again, He comforted, "It's ok."
Again, I argued, "No, it's not ok. How can you say 'It's ok'? I had an abortion. I took my baby's life. It's not ok!" This exchange went back and forth a few times before the Lord gently and patiently spoke these loving words, "Sue, do you think you could have been a better parent than Me?" Quietly with eyes down, I responded, "No, of course not." Again I heard, "It's ok."
The extent of God's grace and love will forever elude me. My mind cannot comprehend the depth of His love, grace and forgiveness. It is too wonderful for me! All I know is that it is in the quietness of His presence that I have found redemption. His whispers heal the deep and vast crevices of our hearts with His unfailing love. Father, your love is too wonderful for us to comprehend. Your forgiveness and grace is too marvelous for words. Lord, I ask for you to heal the deep areas of our hearts. I ask for ears to hear your voice as you speak sweet whispers of love. That you would bind the broken-hearted and set the captives free. In Jesus' Name, Amen. This week we are on a family trip at the beach. Last night, Sarah and I stood on the balcony as we watched lightning flash in pulsating colors across the night-sky canvas. The majestic light show was magnificent. However, as I stood there gazing on God's beautiful beat of blazing beams, my mind was fixed on a different beat--a heartbeat silenced. Tears filled my eyes. My daughter noticed. "Sarah, I can't tell you right now, but I promise I'll tell you someday... Mommy made a bad decision." "You made a bad decision? ", she said with surprise. She went on to confess that she too made a bad decision and had lied to someone. It was a sweet moment. We hugged and talked and prayed. In her mind, her sin was huge and she felt the weight of it. However, knowing others fail freed her to find forgiveness. This is why I share. I share my story so others can find freedom and know that they are not alone in their heartache and pain. I share so others will know there is forgiveness and restoration in Jesus. I plan to share my story with my children someday when the time is right. It is a story of forgiveness and freedom. A story of grace and love. A story of restoration and redemption. Just like the night-sky dancing with shades of light, the Lord can take darkness and make it beautiful. His Light overcomes darkness and reveals beauty. The Lord can turn a storm into a stunning work of art. That is my story. Every year for the past couple of years I have prayed for the Lord to give me a word for the year. This year He gave me the word: BOLDNESS. For those of you who don't know me very well, I can be timid, introverted and at times down right shy. Extroversion is something I have had to work at my whole life. I make myself be extroverted. Seriously, I have prayed often for the Lord to help me be friendly. And when I ask, He answers. So, BOLDNESS is not in my natural makeup. When I think of the BOLDEST person in the Bible, the apostle Paul stands tall above all. Tall Paul. I love a good rhyme! Often as I read about Paul in the Bible and how bold he was in his faith, I have thought, "Wow! I would love to be bold like Paul." Perhaps you have thought that as well. I was at the She Speaks Conference and my roomie, Melissa Sherlin, was in the room with me. I showed her my cards and told her their purpose. One of the verses was from Ephesians. All of a sudden, my roommate and I had an epiphany! Paul. Asked. People. To. Pray. For. Him. Paul, amazing and tall Paul, needed prayer for boldness. So encouraging. However, when God is wanting to make a point, He usually says it more than once. The next morning, Melissa and I headed down for breakfast, full of enthusiasm and anticipation for the day. On every table setting, there was a small scroll. Each scroll contained a scripture. Each one was unique and prayed over to be an individualized word for the person who opened its treasure inside. I opened the scroll and immediately was overwhelmed with God's love and presence. The Lord spoke to Paul in a vision telling him to not be afraid and to keep on speaking. The Lord wouldn't have given Paul a vision if Paul didn't need encouragement to be bold. What I believe the Lord was saying to me through these verses was that yes, Paul was bold. However, perhaps Paul also needed encouragement and prayer to be bold. Perhaps there were times when Paul even struggled with boldness. I don't know about you, but that encourages me beyond words. Tall Paul needed prayer and a vision from the Lord and the Lord gave Paul boldness to carry out His mission and accomplish His good work. I know the Lord will do the same for me. Last night I went through the names of all who entered to win this beautiful wallet. Crinkled paper strips laid on my bed. Paper shredded on its own would be nothing more than a mess. However, each of these fragments were personalized with ink. Names penned in ink made these strips individualized. The names made the paper scraps significant. As they laid there all crumpled and torn, I took each paper in my hand and prayed over each name. Yes, I prayed for you each by name. The Lord knows your name. He named you. If you have ever had a child, you probably went through the rigorous pursuit of finding the perfect name. Hours were spend over baby name books or websites. We named each baby long before birth. We loved each one and called them by name before our existence was even known. We understand the importance of a name. So does the Lord. 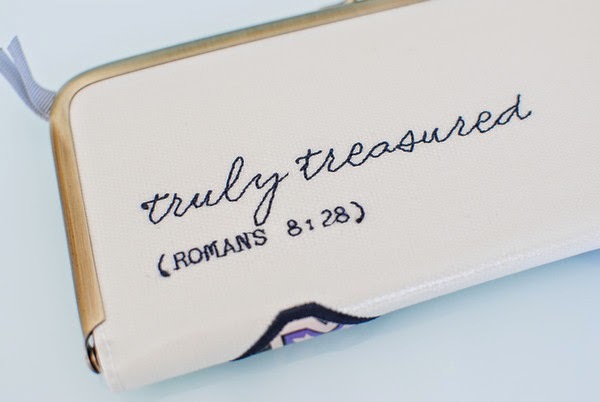 At times we may feel like that crumpled up scrap that laid on my bed, but He doesn't see our torn up mess. Instead, He sees His daughter, whom He named and loved long before we ever knew Him, even before we were born. I pray you would think about your name today. Sometimes the Lord gives us a new name, different than our earthly name. Perhaps ask the Lord what He has named you. He takes your name in His hand and prays over your name. The winner of the giveaway this week is....PAT EWING!!! Congratulations Pat! !